High-performance utility mixers. The DSP-equipped CX versions feature SPX-quality effects built in. The new mid-range MG series mixers offer refined looks and features in a lighter, smaller package. The MG124C and MG124CX fall comfortably in the middle of the MG mixer lineup, and deliver sound quality and advanced features such as channel compression that are unrivalled in this class. You can choose either model with confidence for a wide range of amateur or professional applications: the MG124C if you don't need effects or already have effect gear you want to use, or the MG124CX if you want the sonic and space-saving advantages of high-performance SPX digital built in. For applications requiring up to 12 input channels the MG124C or MG124CX offer stunning MG-series sound plus an extra margin of signal-routing versatility. The only difference is effects. If you don't need effects or already have a collection of outboard effects that suit your needs, the MG124C is probably the right choice. The MG124CX features a high-performance digital multi-effect processor built-in, giving you everything you need in one compact, powerful package. The MG124C and MG124CX both have a total of 12 input channels - four mono microphone/line inputs and four stereo line inputs. Two of the stereo line inputs can also function as mono microphone inputs, giving you up to six simultaneous mono microphone inputs when needed. Gain trim covers a wide -60dB ~ -16dB range for microphone input, and -34dB ~ +10dB for line input. Top-mounted input and output connectors make setting up and re-patching your system quick and easy. Both models feature high quality Neutrik™ balanced XLR connectors on all four mono microphone/line channels and two of the stereo channels. The XLR-equipped stereo channels can accept mono microphone input either via the XLR or phone jack connectors. The remaining stereo channels provide phone jack and pin jack connectors for compatibility with a wide range of sources. The four mono input channels also feature insert I/O connectors that let you patch external signal processing gear into those channels as required. Separate pin-jack 2TR inputs are provided to accept the output from a CD player or similar stereo source. The microphone preamplifiers in any mixer are critical to its overall performance. The microphone preamps built into the MG mixers inherit technology from Yamaha's top-line professional consoles, and have been painstakingly designed to deliver superior sonic performance with any dynamic or condenser microphone. All six microphone preamps feature switchable phantom power so you can take advantage of the natural, extended response of high-quality condenser microphones. A single switch turns phantom power on or off for all microphone channels. Built-in channel dynamics is usually only found on high-end (and very expensive) consoles. The MG124C and MG124CX feature Yamaha's innovative one-knob compression feature on mono input channels 1 through 4. This advanced feature can be a tremendous advantage in achieving great vocal sound. It can also be used to refine the sound of bass, guitar, and other sources. Conventional audio compressors with their threshold, ratio, knee, makeup gain and other controls can be complex and time-consuming to set appropriately for a given source. Yamaha's one-knob compressor eliminates the need for an engineering degree with a single control that lets you simply dial in the amount of compression you want. 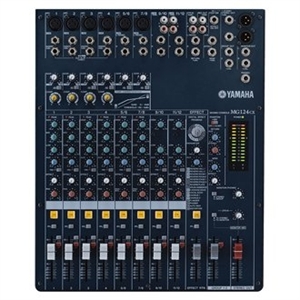 Yamaha has decades of experience in building truly useful, musical equalization into successful pro consoles, and the channel equalizers in MG-series mixers carry on without compromise. Channels 1, 2, 3, 4, 5/6, and 7/8 feature full 3-band equalizers with LOW, MID, and HIGH controls, while 9/10 and 11/12 have 2-band EQ for smooth equalization of stereo sources. In addition to the main stereo bus the MG124C and MG124CX feature a stereo group bus and outputs that can be used for convenient channel grouping. Assign switches for the stereo and group buses are located next to each channel fader. All input channels feature illuminated channel ON switches chat can be used to individually add or remove channels from the mix without having to change the positions of the channel faders. The effect channel on the MG124CX also has it's own ON switch. The MG124CX has pre/post switchable AUX sends on all channels as well as EFFECT send controls that adjust the level of the signal sent to the mixer's internal multi-effect system. The MG124C has dual AUX send controls for each channel, one switchable for pre- or post-fader operation, and one fixed for prefader send. Master send controls are also provided, as are RETURN level controls for the AUX and STEREO busses. Located above the mixer's master controls, on the convenient easy-access connector panel, are the main stereo output connectors, phone-jack monitor output connectors, pin-jack recording outputs, and a stereo headphone jack. These versatile mixers offer plenty of connectivity for a wide range of applications. Channel and master level control is accomplished via reliable, high-performance 60-millimeter linear faders that provide smooth, noise-free operation. An important advantage of linear faders is that they provide a direct visual indication of relative level settings. In spite of the fact that they offer 12 channels, four buses, and a wealth of advanced features, the MG124C and MG124CX are small and light enough (only 2.9 kilograms) to be tucked under an arm and set up just about anywhere. Both of these remarkable mixers provide significant space savings along with huge performance benefits. The MG124CX's includes an astonishing amount of SPX signal processing power. It incorporates a versatile digital multi-effect processor that provides a range of reverb, delay, modulation, and distortion programs you can use to refine and define your sound. Each of the 16 effect programs has a number of editable parameters as well as effect on/off switching capability and return level control. If you need to keep both hands free to play an instrument or perform other operations, an optional footswitch can be connected to the mixer's effect footswitch jack for convenient on/off switching.